Marigold is a bright-colored summer flower, which is also known as Calendula. Marigolds are a versatile plant, that comes in a variety of color, bloom size, and height. It is most commonly found near ponds, shores, quiet waters, springs, ditches, in streams, wet meadows, wetlands, and sometimes even underwater. Marigold is an herb that is believed to one of the earliest cultivated flowers. It has been used for several ailments due to its medicinal properties. Ancient Greeks used marigolds for various purposes such as to create makeup, for dye both of food and clothing. Plant: Calendula is a short-lived sweet-smelling perennial plant, grows up to 80 cm tall, with infrequently branched. Leaves: The leaves of calendula are oblong-lanceolate are hairy on both sides and are about 5–17 cm long. Flowers: It has vibrant golden yellow flowers, consisting of a thick head or flowerbed which is 4–7 cm diameter encircled by two rows of hairy bracts. The calendula flowers may appear all year long where environments are suitable. English names: It is known by various name such as Scottish Marigold, English Marigold, Garden Marigold, Ruddles, Common Marigold. 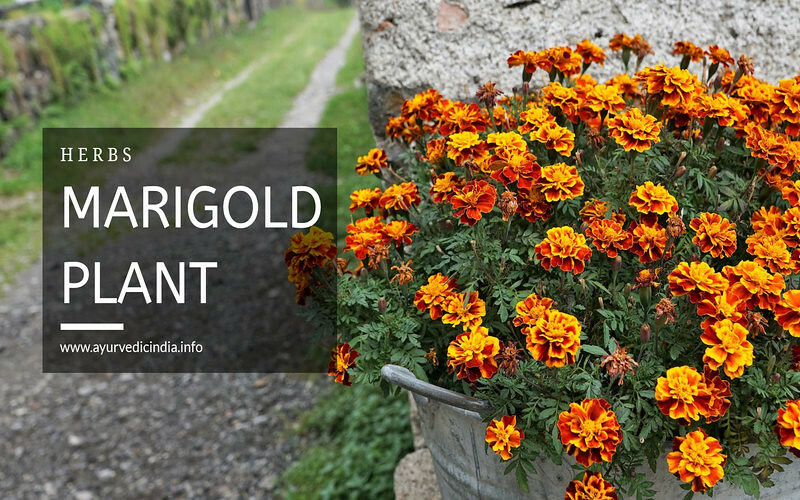 Marigold is absolutely an amazing medicinal plant has forged its way into Egyptian, Indian, Greek, and Roman medicine as well as into the herbal healing arenas of the Europeans. The most important element for which Marigold is known for is it’s antioxidant’s properties. An antioxidant is a property that is known to be capable of fighting the damage led to free radicals. In today’s by-products of environmental circumstances such as pollution, cigarette smoke, etc., the antioxidant is essential. These antioxidants help to lower the risk of cancers, heart ailments and even protect the eyes from macular deterioration and cataracts. Besides this, Marigold (Calendula officinalis) is also helpful in dealing with conditions such as rashes, allergies, dermatitis, eczema, swelling, pain, redness caused from muscle cramps or sprains or muscular injuries, itchiness caused by conjunctivitis, eye inflammation and fungal infections such as eczema and athlete’s foot. below are some more marigold plant benefits. Marigold! Calendula is among one of the several herbs that are used traditionally to treat eye inflammations and conjunctivitis it is also helpful to treat redness of eye infections and to reduce the swelling. It is also believed that Marigold may have some anti-spasmodic action, which has been used to relieve menstrual cramps. A recent study by the Fedkovich Chernivtsi State University of Ukraine on Marigold! Calendula shows that it has anti-cancer properties. In conjunction with other herbs such as Scorzonera humilis L, Aconitum moldavicum and Echinacea purpurea, MarigoldHas showed evidence of success in treating certain cancers. Marigold! Calendula has been medicinally used around the world for centuries. It has been traditionally used to cure eczema, blepharitis, conjunctivitis, warts, and minor injuries such as wounds, sprain’s burns, cuts. Insect bites and bruises and minor burns, including sunburns. It has also been used to treat coughs, cramps, and even snake bites. Due to the high content of flavonoids, Calendula act as anti-oxidants in the body. It protects our body cells from damage caused due to a chemical process called oxidation. Oxidation generates oxygen-free radicals and natural chemicals that suppress immune function. A recent study on animal studies shows that Calendula contains flavonoid, which speeds up wound-healing by increasing blood flow to the affected area and rapidly increases the production of collagen proteins. Calendula also acts as antiseptic and anti-inflammatory effects due to its flavonoid content. In mouthwashes and gargles, calendula helps to soothe a sore throat or mouth tissue; and moreover has been using to treat hemorrhoids. Marigold! Calendula tea or infusion can be made for the healing of irritating, painful colitis, Stomach ulcers, and mouth ulcers. Calendula is used for healing of external ulcers, and Wounds Calendula works by stimulating the lymphatic system and reduces swelling and cleansing pf toxins in the body. It works as anti-septic and improves blood circulation to the affected area. Although further research is needed in late Some clinical studies (Chakurski 1981, Krivenko 1989)validate the treatment of stomach ulcers. Calendula contains property that is advantageous in reducing infection and promoting injury healing. It has been used in order to treat a variety of skin diseases. Moreover, has been seen productive in the treatment of skin ulcerations, eczema, juvenile acne, and dry phthiriasis. Improvement has been viewed within 3 to 4 days of treatment according to the study by (Universitatea de Medicina si Farmacie). Crushes of calendula flowers are useful for varicose veins. Results from current animal and laboratory reports show that calendula might also have some anti-infective properties, which can against fungal infections and against viruses. Calendula’s high-molecular weight polysaccharides motivate immune system activity (Wagner 1985) moreover; have been researched for immune system activity. It was at first determined to have some possible therapeutic activity against the human immunodeficiency virus (HIV) extracts significantly inhibited HIV-1 in vitro and reduced HIV-1 reverse RNA polymerase in a dose- and time-dependent manner (Kalvatchev 1997). Calendula cream is good for acne and nappy rash. Calendula is good for digestion. And symptoms of menopause also relieve colitis. An anti-fungal agent in Marigold! Calendula is used to treat Candida, ringworm, and athlete’s foot, tincture applied to cold sores encourages healing. Study on about 250 women who had been undergoing radiation therapy after surgery for breast cancer who used the calendula ointment has reported less pain from the radiation. Marigold! Calendula ointment reduces the amount of skin irritation and anti-viral actions better than other commonly-used commercial preparation Investigations into anti-cancer continue. The person using anti hypertensive or sedative medication should consult the doctor before using marigold herbs or products. The study performed by University of Maryland medical center has revealed that marigold can affect the menstrual cycle, hence the pregnant women and breast feeding women have to be careful in using it. Ancient Greeks commonly marigolds to creat makeup due to is strong coloring ability, besides this as dye for both food and clothing. It has also been used as edible in cooking for centuries. In addition, marigold was us as medicinal purposes, in fact, even today it is used.